I was working on a completely different design page here at Retro Invites when I came upon these picturesque invitations and just had to share them here for you. We all know that watercolor invitations have been trending for quite a while and natural woodland landscape and animals are extremely hot in the fall. Well, one of the many talented designers at Zazzle took those two concepts and created something truly outstanding. I think these enchanting woodland watercolor wedding invitations are heart stopping. I fell immediately in love! Take a look to see if you don't agree! 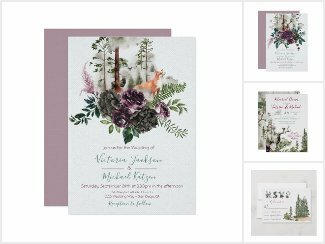 Shown above is just a small sampling of what you'll find in this elegant forest scene invitation collection which includes all of the different types of wedding stationery that you'll need for your romantic gathering. There are many different woodland animal designs to choose from too and each is just as lovely as the next. In fact, if you love this design as much as I do, you're going to have a hard time choosing just one! So why choose? You can mix and match these stunning watercolor invitations in any combination you desire. ​Order as many or as few as you need. Each one comes with a standard envelope and Zazzle's 100% satisfaction guarantee.